The small scale 10mm-15mm version (#143) which plays on a 3ft x 4.5ft printed terrain mat, printed in the center of a 4x6 mat. This allows the battle to be fought at the correct ADF scale of 1 inch = 80 to 100 yards. The extra space around the edges provides a some extra space for dice, books and charts, markers, etc. This scale is perfect for 15mm ADF, or 6mm - 10mm figures for other regimental ACW rules sets. 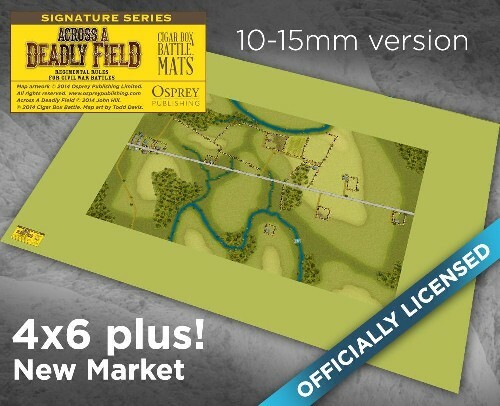 As with all of our licensed Osprey Publishing mats, these ADF mats come printed with roads, buildings, streams, etc. All you have to do is add the figures (and hills if you like) and play!